EURUSD failed to breakout of 1.1500 resistance and stayed in a trading range between 1.1215 and 1.1500. 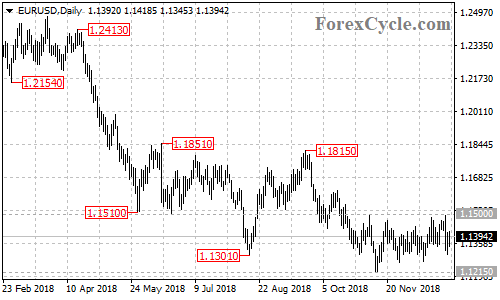 As long as 1.1500 resistance holds, the price action in the trading range could be treated as consolidation for the downtrend from 1.1850, a breakdown below 1.1215 support could trigger another downside movement towards 1.1000. On the upside, a break of 1.1500 resistance would suggest that the downside move from 1.1815 had completed at 1.1215 already, then the pair would find next resistance at around 1.1700.